Traditional shake down glass analog thermometer. 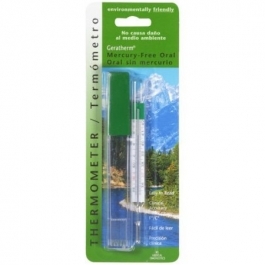 Oral nontoxicmercury Free thermometer with magnified optic case included for easy readability. Dual scale Fahrenheit and Celsius. As accurate as mercury thermometers. Easy to disinfect or sterilize. Easy to read. Clinical accuracy. Fahrenheit/Celsuis. Grasp top of thermometer and shake with a snapping motion of the wrist. Repeat until line is well below 37 degrees C (98.6 degrees F). Place thermometer under the tongue for a minimum of 3 minutes. Before storing, wipe clean with cotton ball or gauze square saturated with alcohol.